Last weekend, I was at Madison Square Garden for guitar / music festival and was keen to find vegetarian and healthy options to eat (as always). While my attempt at eating vegetarian food was unsuccessful, I had a delicious chicken hot dog at the Simply Chicken by Jean-Georges concession stand. I was somewhere between Section 110 and 118. 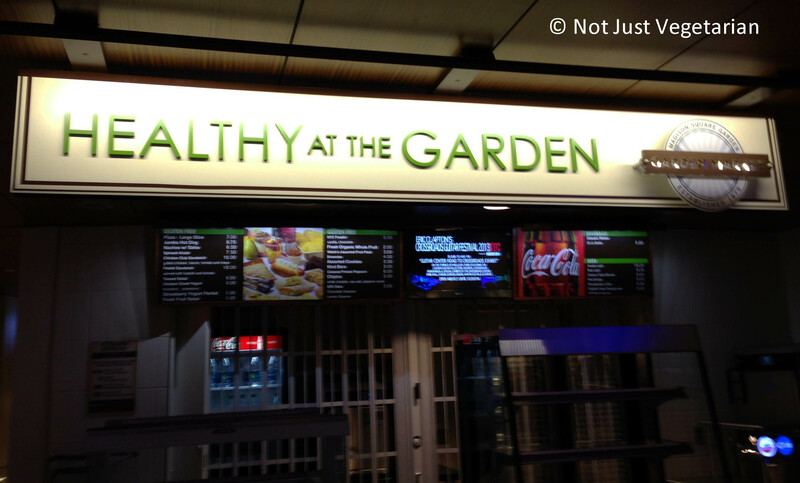 After much searching on my floor, I came across the “Healthy at the Garden” concession stand and was excited. But my excitement was short-lived – the concession stand was shut. Had it been open, the vegetarian options were strawberry yogurt parfait, Greek yogurt, spinach knish, nachos with salsa, fresh fruit salad, falafel sandwich and a large pizza. 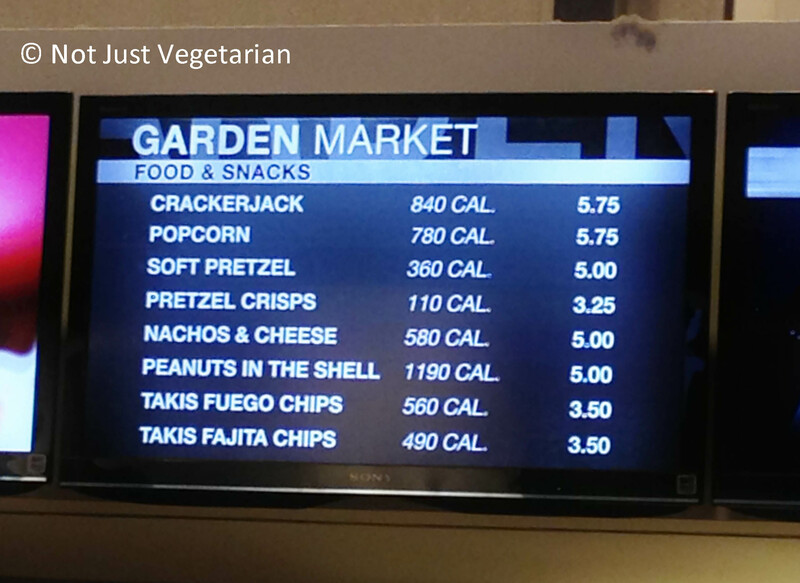 The concession stand also listed some Gluten-free and non-vegetarian items, but it was pointless then, because the concession stand was shut. There were regular snack items like popcorn, soft pretzel, pretzel crisps, etc. 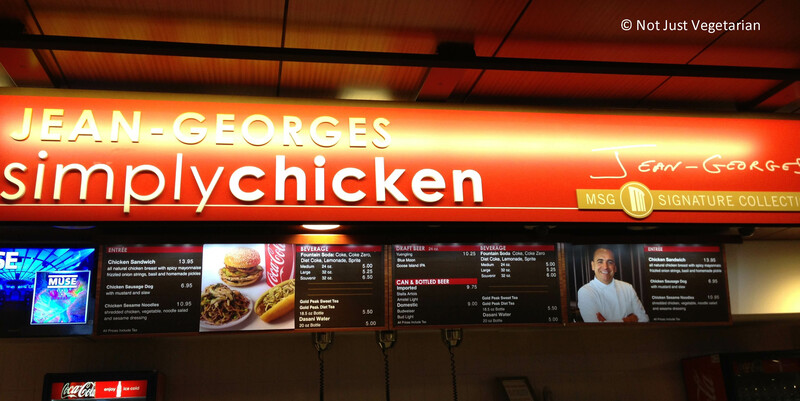 in other concession stands (see photo below), but I was in the mood for something more substantial. Also, do you see the calorie counts listed next to these items? After some walking around on the same level, I found “Simply Chicken” by Jean-Georges and got the chicken hot dog. This was delicious!! I loved the (stone) ground mustard sauce which was tangy and spicy and the very fresh slaw. The slaw was chilled but not awfully cold, was shredded very thinly, and retained its crunchiness. I have often had over-chilled, soggy slaw, but this slaw was unlike any of those bad ones that I have tasted otherwise. Turns out that the “slaw” is not really slaw, but is kimchee – read Jean-Georges blog to know more. I highly recommend this Chicken Hot Dog from Simply Chicken by Jean-Georges (somewhere between Sections 110 – 118).